This month we opened our brand new Cosmetic and Laser Center–a division of Blue Ridge Dermatology Associates, P.A. 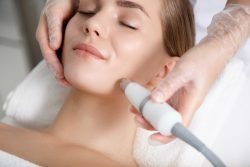 To provide these services, we have added a new medical esthetician and a front desk skin care specialist–both of which have extensive experience in the esthetic industry as well as healthcare. Nija truly cares for her patients and strives to give each the best possible outcome through compassion and respect for each person she comes in contact with. The esthetics industry is continually changing, and she is devoted to remaining at the forefront of technology and skincare products. Tammy Johnson is a certified nursing assistant with extensive training in patient care and over 26 years of experience in the esthetic industry. She has previously owned and managed two salons of her own. Her background also includes anatomy, microbiology, and knowledge of how healthy skin can be promoted from the cellular level by way of preventative product education and today’s laser technology. As Blue Ridge Dermatology’s new front desk associate and in-house cosmetologist/skin care specialist, Tammy looks forward to sharing her skin care knowledge with our patients. The most exciting part about this new division of Blue Ridge Dermatology is that we are now able to open up our cosmetic and laser services to the public. You no longer need to be an existing patient of our dermatology practice to enjoy cosmetic treatments, so be sure to tell your friends and family about this exciting new addition to our community. Our cosmetic and laser center is located at our Raleigh location at 3225 Blue Ridge Rd., Suite 101. Call 919-781-1050 to schedule an appointment today.